The absence or scarcity of precipitation could drastically limit the dispersal of splash-dispersed propagules such as the Septoria pycnidiospores produced by Mycosphaerella graminicola in wheat or the sporanges and spores of potato leaf blight. Rusts are well-known examples of diseases dispersed by wind over long distances. The recent outbreak and dispersal of Ug99 (a highly virulent race of Puccinia graminis f. sp. tritici that causes susceptibility in most wheat cultivars) that has moved from eastern Africa to Yemen and Iran, now threatens southern Asia's wheat growing areas. 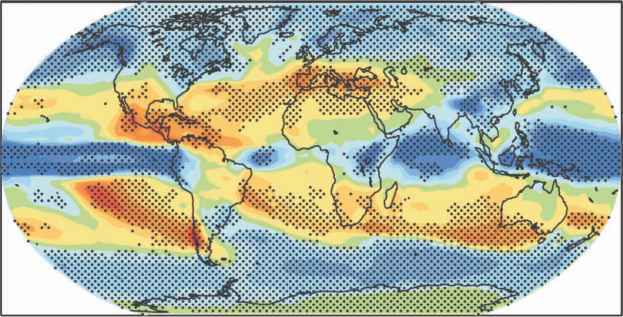 Although the exact cause of dispersal was not pinpointed, it is suspected that unusual wind and storm events might have spread the inoculum to Iran (Hodson et al, 2009). tionary forces, and the resulting consequences are given hereafter (and see Table 4.3).